Amanda graduated from Lasell College in 2012 with her B.S. in Athletic Training. She then went on to graduate from Northeastern University in 2016, with her Doctorate in Physical Therapy. She has clinical experiences with local high school/ collegiate sports teams, outpatient orthopedic clinics and a subacute nursing home facility. Throughout her clinical experiences, she has worked with patients of all ages with a special interest in the sports medicine population. 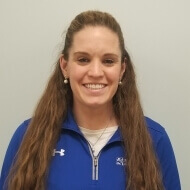 She participates in continuing education courses, implements the most current evidence based research, performs functional movement screens, integrates manual therapy techniques, and has a special interest in aquatic therapy. Currently she is pursing certification to become a certified manual physical therapist through North American Institute of Orthopedic Manual Therapy. In her free time, Amanda loves spending time with her friends and family, watching New England sports, running, and being outdoors.